Winter time is here, and it's about to get nasty, so we've gathered information to help you stay safe during the upcoming frozen, frigid, storm that's about to hit. The days are getting longer, but we still have a couple months to go before we shed our outer layers. We are in the heart of winter, which means skiing, snowball fights, ice skating, and the occasional patch of yellow snow. However, winter also brings with it many hazards to your health, some of which can be deadly. Most of us know to get out of the cold. It's plain uncomfortable. But what are the health risks we face by staying in the cold too long? How de we stay warm if there is a power outage from a winter storm? What other risks do we face during these cold months? To answer these questions and others, we have compiled a list of potential winter health risks and information on how to avoid them. Some might seem quite obvious, but knowing the steps to take will help you prepare for a safe and warm winter. There are plenty of activities for outdoor winter fun. But staying in the cold for too long can be harmful. When your body is exposed to cold temperatures, it can start to lose heat faster than heat can be produced. This can lead to hypothermia, or abnormally low body temperature. As low body temperature can affect the brain, victims of hypothermia may be incapable of thinking clearly or moving well. Consequently, they may not know that they are suffering from low body temperature. You should become familiar with the warning signs of hypothermia. In adults, symptoms of low body temperature include shivering, exhaustion, confusion, fumbling hands, memory loss, slurred speech, and drowsiness. In babies, symptoms include extremely low energy and bright red, cold skin. Remove any wet clothing the victim might be wearing. Using an electric blanket or skin-to-skin contact under dry blankets, warm the center of the victim's body (chest, neck, head, and groin). Giving the victim warm beverages can also help. However, do not give alcoholic beverages nor give beverages to an unconscious person. Even after the victim's body temperature begins to increase, keep the person dry and under a warm blanket. Exposure to cold temperatures can also lead to frostbite. Frostbite occurs when parts of the body freeze - most commonly the nose, ears, cheeks, chin, fingers, and toes. Frostbite can permanently damage the body, sometimes so badly that the victim requires amputation. Because frozen tissues become numb, victims are often unaware of frostbite. If you start to experience pain and redness on parts of your skin, cover any exposed skin and get out of the cold. You may already have frostbite if you see an area of white or grayish-yellow skin; if your skin feels abnormally form or waxy; or if you experience numbness. Place the affected area in warm water. Do not place it in hot water as you might scald yourself. You may also warm the affected area using body heat, such as placing frostbitten fingers in your armpits. The best way to protect yourself against the dangers of hypothermia and frostbite are to prepare yourself. Wear warm clothing; cover exposed skin in extreme cold, or stay indoors; make sure your car and home are insulated. Doing these things will help you stay safe. When a winter storm is headed your way, make sure you're ready for it. 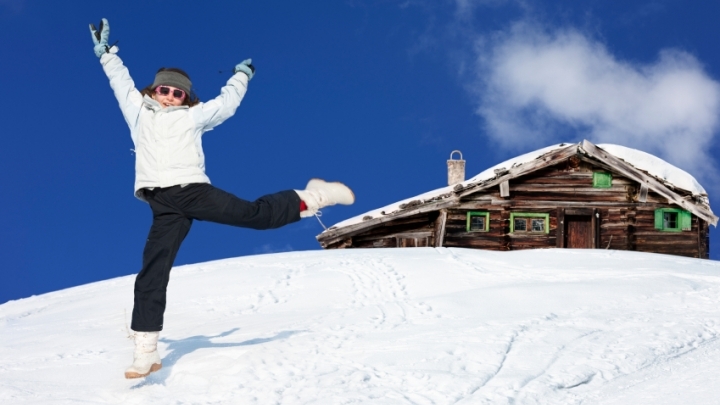 For many people in cold climates, homes are already well equipped for staying warm. However, you should check that your heating system works and that your house is properly insulated. Weather-stripping doors and windows, installing storm windows, and investing in snow-removal equipment are all good ways to prepare your house for a storm and its aftermath. It's also a good idea to have a back heating in case of a power outage. Make sure you have wood for your fireplace or wood stove. If you don't have these, think about purchasing a kerosene heater. Whenever using any of these back-up heating devices, equip your home with smoke detectors and battery-operated carbon monoxide detectors. Well over 100,000 people are affected by carbon monoxide poisoning each year in the United States. Many of those cases are deadly. Anything that burns fuel may emit carbon monoxide. This is why it is important to have carbon monoxide detectors if you are using a fireplace, wood stove, of kerosene heater. As carbon monoxide is a colorless and odorless gas, many people do not realize they are being poisoned. Common symptoms of carbon monoxide poisoning are headache, dizziness, chest pain, nausea, and vomiting. In serious cases, people can become irritable and confused, then sluggish and eventually fall unconscious. If you think you're experiencing carbon monoxide poisoning, open your windows, leave your home, and get fresh air. In cases of severe poisoning, all 911. In addition to being cold, winter is also cold and flu season. As we are all huddled together trying to stay warm indoors, we are also more likely to share our germs and get sick. While the common cold has no cure, there are ways to avoid it. Eating a healthy diet, getting enough sleep, and exercise are all ways to keep up a natural resistance to the common cold. Keeping your house humid also helps. When your house is dry, the mucous membranes in your mouth and throat dry up and crack. These cracks allow cold viruses to enter the body more easily. The best way to recover from a cold is to rest and drink lots of water and fruit juices. Mild pain relievers can also help. While there are many over-the-counter medicines that relieve some cold symptoms, they do nothing to shorten the duration of a cold. Influenza - aka "the flu" - is a contagious respiratory infection. For most people, having the flu means a week of agony. For others - such as the elderly and those with chronic health problems - it can be deadly. Symptoms of the flu are similar to those of a cold. However, flu symptoms are usually much more severe in intensity. They include fever, chills, cough, sore throat, and runny nose as well as soreness and aching in the back, arms, and legs. Influenza vaccines have been proven to reduce the chance of contracting the infection in addition to reducing the severity of symptoms. Flu vaccines are only effective for one year. So, it is a good idea to get vaccinated every year as flu season approaches (sorry for the late message). Other ways to avoid the flu are: avoiding close contact; staying home while sick in order to avoid spreading your illness; washing your hands; avoid touching your eyes, nose, or mouth; stay active; manage your stress; drink plenty of fluids; and eat healthy. By becoming aware of and preparing for these dangers, you can relax a little more and enjoy all that the winter months have to offer. Now go outside and make a snow angel! But remember to wear the proper clothing. Centers for Disease Control and Prevention, "Winter Weather" Illinois Department of Public Health, "Winter Health Tips" New York City Office of Emergency Management, "NYC Hazards: Carbon Monoxide" Centers for Disease Control and Prevention, "Preventing the Flu: Good Health Habits Can Help Stop Germs"